Sweet potatoes are delicious, nutritious and very easy to grow. They are high yielding, producing up to one pound per plant. You can store them for months without refrigeration. Beauregard has a rose-colored skin and orange flesh. The yield is very good and it stores well. It is normally ready to harvest in 100-110 days after planting. It is suitable for early planting. Bonita is a white potato. It is very sweet and excellent for fried sweet potatoes. It has superior disease resistance and is easy to grow. Covington is an orange fleshed potato. Yields are high with a very good flavor. Harvest is 105-115 days after planting. Slips generally need at least 4 months of frost-free growing. They grow vigorously in warmer areas, quickly shading out unwanted weeds as the season progresses. 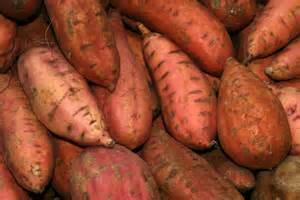 Sweet potatoes prefer loose, well drained soil. Work in lots of compost and make raised beds or planting ridges 8 to 12 inches high if you have clay soil or drainage problems. Plants must be planted quickly after they arrive, but wait for warm weather. If it's still too cold to plant outside or your garden isn't ready, loosely plant the slips in a temporary location (in a flat or nursery container indoors) for transplanting later. Your plants may not have roots but with good care new roots will develop quickly. Transplant your slips outdoors 2 to 3 inches deep (the leaves above the ground) and 10 to 18 inches apart in rows at least 3 feet apart. Plant in the evening and water in well. Keep the soil moist until the plants are well established. Sweet potatoes can produce will with little watering after the plants are established, however, irrigation will help produce a larger harvest. Be sure to keep the young plants free from weeds until they are large enough to shade them out. For better yields and larger potatoes, place a shovelful of compost around each plant, but sweet potatoes usually produce well with low fertilization. Protect the vines from deer as they love the green plants. Harvest sweet potato leaves and young shoots for cooking greens at anytime during growth. Be sure not to harvest too much at one time. Harvest the sweet potatoes when they reach your preferred size. Dig one of your plants when the crop reaches the recommended growing time (between 90 and 120 days depending on the variety). Try again in a week if the tubers are too small for you. Harvest on a sunny day when the soil is not too wet. Pull aside the vines so you can see where you're digging, begin digging about 12 to 18 inches away from the center of the plant to avoid damaging the sweet potatoes. Go down about 6 inches, angle towards the center of the plant, and gently lift out the potatoes. separate the potatoes and let them dry in the sun for no more than 1 hour. Handle freshly dug potatoes gently to prevent bruising. Any sweet potato left in the ground will continue to grow until frost, growth slows as the weather cools. For best storage quality, harvest before soil temperatures reach 55ºF.